Sign is "quite iconic" and "something of a landmark in that part of Dublin" according to Irish Catholic editor, Michael Kelly. 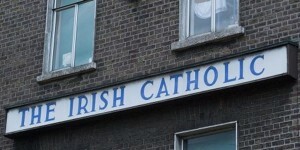 The well known sign for The Irish Catholic is to remain on the facade of a building at 55 Gardiner Street, the newspaper’s former premises, following a rejection by An Bord Pleanála of an application to replace the sign with the word ‘Paddywagon’. The Paddywagon hostel operator and tour provider applied to Dublin City Council last March for permission to change the lettering on a sign for the newspaper, but this was refused. 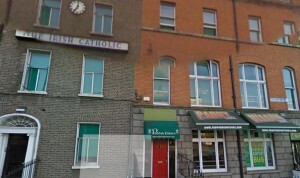 Founded in 1888, the Irish Catholic’s original offices were on Middle Abbey Street but in the 1950s it moved to the corner of Gardiner Street and the simple fascia sign was erected. The newspaper remained there until 2007 when it was bought by the Irish Farmers Journal and its premises moved to the Irish Farm Centre in Bluebell. In its appeal to an Bord Pleanála, the Paddywagon Hostel argued that the council’s decision to reject the proposal meant it placed “exceptional value on something mundane and ugly”, and said the council’s case that the sign was equivalent to pop art was “ironic” given its unattractive appearance. Planning policies “ought to support a domestic export enterprise such as Paddywagon [as] it contributes significant taxes and fosters visitors to the country,” it said. A conservation officer argued that the Perspex acrylic used in the sign might have dated back to the 1930s, and it was integral to the “artistic, social and cultural significance of the building”. The Paddywagon Hostel countered that the sign was a “classic American-style plastic fascia sign” typical of the late 1950s, and had been erected in 1958. Commenting on the decision, Irish Catholic editor Michael Kelly said he had great affection for 55 Gardiner Street as it was the historic home of ‘The Irish Catholic’ for many decades and the place where he first started working for the newspaper in 2005. “The sign if quite iconic and I remember it as a child as something of a landmark in that part of Dublin,” he told CatholicIreland. He did not believe the sign had any “particular artistic value” but agreed with the conservation officer who argued it was “integral” to the cultural significance of the building. “I note that the hostel owner describes the sign as ‘ugly’ and it’s certainly true that it’s hardly a thing of beauty, but it is understated and more fitting to the building than some of the gaudy livery I have seen in buildings nearby,” he added.